A New Leaf Hypnosis is excited to now offer the Virtual Gastric Band Hypnotherapy protocol developed in Great Britain and proven through clinical trials to be 95% effective! During the first 90 minute session, the subconscious mind of the participant believes that they have undergone bariatric surgery in to reduce the stomach to the size of a golf ball. This is followed by four further sessions (for a total of 5 sessions) which deal with the psychological triggers that allow a person to overeat. Feedback shows that the hypnotherapy is like ‘flicking a switch in the brain,’ turning off cravings and eating only until satisfied. Clients will be asked to follow a few simple guidelines, including listening to a 20 minute recording at least one time a day for a month. Additionally, clients will receive a daily email with tips, support and reinforcement between sessions. Weight loss varies from client to client, but many clients lose up to 7 pounds in the first week with 1-2 pounds a week thereafter. For more information, please call me at 757-514-1415 or fill out the form below. 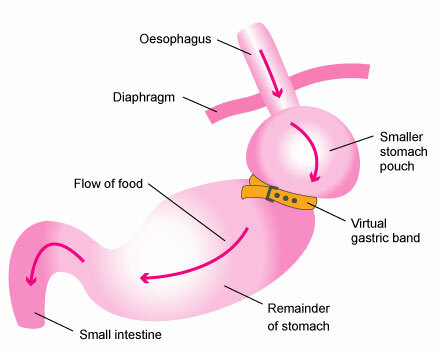 The Virtual Gastric Band has received much attention in the UK, attracting people from all over the country to undergo the treatments which have a 95% success rate. I am very excited at the prospect of being able to help my clients to lose weight in this way. There is nothing magical or mystical about hypnotherapy, instead it is a method that enables a person to help themselves.